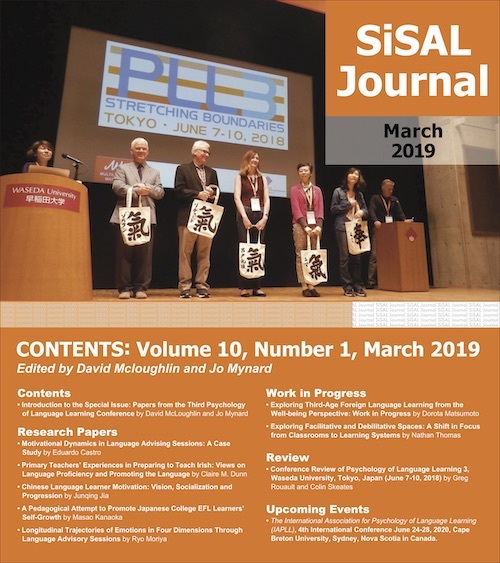 SiSAL Journal will publish a special issue on selected papers from the Psychology of Language Learning Conference 3 (PLL3 http://www.pll3-tokyo2018.com/) in March 2019 (Volume 10, Issue 1) edited by Jo Mynard and David McLoughlin. PLL conferences are organised by The International Association for the Psychology of Language Learning (IAPLL http://www.iapll.com/). IAPLL is an interdisciplinary association of scholars with an interest in exploring the psychological dimension to language learning. We aim to foster research, hold conferences, issue publications, cooperate with related organizations and carry on other activities for those interested in the study of the psychology of language learning throughout the world. The third international Psychology for Language Learning conference (PLL3) was held at Waseda University, Tokyo, June 7-10, 2018. The theme of the conference was “Stretching Boundaries” and the aim was to bring together people from all over the world to share their interest in the role of psychology in the learning and teaching of languages . Please follow the journal style guidelines and submit your manuscript as an e-mail attachment to the editors at: Editor@sisaljournal.org by November 1, 2018. If you are interested in joining the editorial or review teams, please get in touch. Only papers presented at PLL3 will be eligible for inclusion in this special issue (with the exception of conference reviews). Other papers on the theme of psychology of language learning beyond the classroom could be submitted for consideration for a general issue of SiSAL Journal.